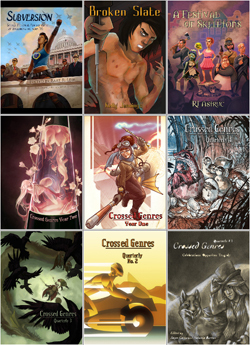 Two days left to get every Crossed Genres title for only $20! Tomorrow (Tuesday, 1/31) is the final day of CGP’s special ebook bundle offer: Get all 9 current CGP titles for only $20! That’s more than 1/3 off the regular price! That’s over 1,900 words of fiction every day for a year, for less than $0.06 per day! You’ll receive all titles in 3 DRM-free formats (PDF, ePub and Mobi), which cover pretty much every ebook reader, computer and smartphone out there! Go here to read more & to purchase the bundle!